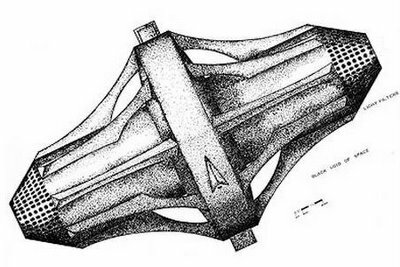 Be sure to stop by Pruned for some amazing new posts and images, including Asteromo, "an outside-inside ellipsoidal earth," designed by Italian architect Paolo Soleri. Soleri, of course, was also the man behind Arcosanti, that monument to dust-covered magazines, old toilets, bureaucratic inactivity and failed utopias in the otherwise beautiful Arizona desert. In any case, Pruned compares Asteromo to other plans "using actual asteroids" as spacebound earth-surrogates, rescuing humans from a poisoned biosphere. [Image: As Pruned quotes: "Man, standing head toward the axis of rotation, will be enveloped in a solid ecology” – surely a haiku if there ever was one. Or perhaps this is haiku as rediscovered by Aleister Crowley, a Tarot card for the Space Age. (Illustration by Roy G. Scarfo)]. 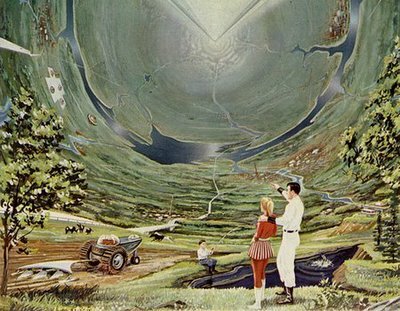 An earlier idea, for instance, by "futurologists Dandridge Cole and Donald Cox," would have created a nomadic pseudo-earth by "fusing and sculpting" domestic space inside a captured asteroid. This would be done using "heat from solar mirrors." The result would be a "gigantic geodesic interior chamber," created "in much the same way as a glassblower shapes a small solid lump of molten glass into a large empty bottle." Then, however, I was cleaning house last night when I found an old copy of Wired – I must be living in Arcosanti – which I promptly wasted more than an hour and a half reading in its entirety. 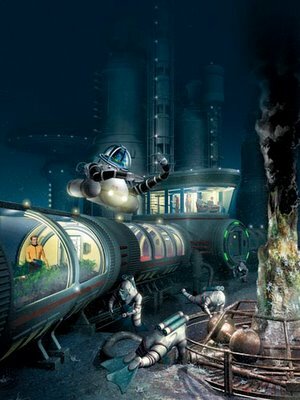 But therein I re-discovered Phil Nuytten's plans for Vent-Based Alpha, an undersea hot-vent microtopia powered by geothermal energy. From the article: "'Essentially, it's like taking a cruise ship with several hundred people and parking it at the bottom of the ocean,' Nuytten says. 'After three or four generations, inhabitants would ask, Are there really people who live on the surface?'" Which is fair enough – the place will have gardens, for instance, and everyone will get exercise somehow, etc. – but, even aside from the obvious questions of population growth and a need for more space, I can't help but picture those people a bit further down the line, once several generations have been bred in the darkness, devolving into a state of permanent dementia, confused brains hardened from lack of sunlight and vitamins, stumbling through the pressurized halls of their own undersea prison, wearing stained clothing and listening to Mozart, talking to reflections, teeth yellow, repeating things, forgetful, screwing their own children, half-insane. Failed Utopias, easy targets ... why so hard on Arcosanti, Geoff? I hope you're really working on one of these screenplays, I'd love to see a movie (or several movies) of this stuff. I had known about Arcosanti for at least a decade before I finally had a chance to visit, and I was really excited to see the place. My being hard on it in the above post doesn't come from having a problem with the intention, or the utopianism, the location, or even the architectural ideas – or the bells they sell, for that matter – but it was unbelievable to me that a place could still be in such a state of half-constructed disrepair for so long. It's been something like 27 years since they started building. What have they been doing? Why are dust-covered copies of National Geographic from the early 1990s sitting unread on tables near badly maintained public restrooms? It was like a Rob Zombie film, or a derelict suburban family room, post-Poltergeist. The place had the feel of a summer camp that had never been fully constructed, was being run by absent landlords, and had been taken over by teenagers or burnt-out ex-hippies (or both) who didn't actually care about the place. Entire cities are being constructed in China – entire suburbs and town cores and malls and subway systems all over the world, in fact – in the time it seems to take Arcosanti to clean the windows. I was amazed, frankly, and would only have to assume that the place is being managed by an under-achieving bureaucratic control freak who won't let anything happen – otherwise the place would've been fully constructed two decades ago. I mean, I once spent time with a professor who was building his own house, alone, in the woods, and the guy has finished the thing, installed fireplaces and ductwork and built a side-garage, and even hauled archaeological artifacts (he's an archaeologist) up to the monumental cathedral ceilings of the second floor – and he did all this by himself! If utopia means forming committees to sit around a dusty table, everyone looking meekly at everyone else, shy, scared of saying what they really think, waiting for someone else to make a decision, then Arcosanti is utopia. But if enthusiasm, accomplishment, hard work, ideas, etc. – with an emphasis on accomplishment, actually doing something – are to play a part in any future project of that sort, then Arcosanti should be abandoned to the winds of Arizona. Lack of funding holds them back, perhaps? Well, any number of ecologically aware product manufacturers have found a way to get the attention of developers, architects, construction contractors, etc., benefitting everyone, setting an example for everyone; whilst Arcosantians sit around, haunted by the specter of Soleri, contributing nothing of any kind to the sustainable design community. Take the winners of last year's Solar Decathlon – one of them has built what amounts to an entire solar-powered village in western Massachusetts as a kind of prototype suburb for sustainable, solar-powered housing worldwide. That took less than a year. In that time Arcosanti has produced a lot of ceramic bells, which they have sold to puzzled tourists. It's like a Chevy Chase movie! I'd love to be proven wrong; but I personally think the people who run Arcosanti right now should be embarrassed. And then replaced. And I'm with you on the screenplays, by the way; these ideas are going into notebooks, and something will come out of them soon... (And any excess frustration in the above comment that might seem directed at you, sevensixfive, is entirely, 100% meant for Arcosanti. In case you think I sound aggressive. I enjoy your comments). Haha, no way, Geoff, great rant! I asked because I visited Arcosanti myself about 12 years ago and had pretty much the same impression. It's worth getting angry about because it *could* be so cool! They've taken a really great idea and ran it into the ground. Finished or not, though, I think it deserves to be there, whether as a ruin whose original purpose is forgotten, or a monument to a broken ideology. Can't remember if I first ran into arcosanti on bldgblog or elsewhere. But your experience visiting it helps explain why I never heard of it despite living in Arizona for 3 years. It also places the rather odd website in context. I could not quite figure out there seemed to only be distant pictures of half-finished giant structures and close-up pictures of volunteers doing stuff, but few images of small, actually finished elements of the greater whole. The website conveyed the impression that the place is more mirage than destination. Your extrapolation of Vent-Based Alpha's future jibes perfectly with the strange, insular results of small closed cultural groups, whose psychotic developments dog science fictional stories of generation ship star exploration colonies from the '50s and '60s, although I swear you're also half-evoking Herzog's "Aguirre, Wrath of God" with the last line. I'd love to see some decent sociological research on the break-point or points of population size at which a culture falls into self-absorbed psychosis. Is it possible to have a relatively homogenous isolated population that doesn't go insane? Perhaps once a population grows to a size in which functional subgroups must form because of the impossibility of interaction between a given individual and the entire rest of the population in any meaningful interval of time, the formation of subgroups and resultant subcultures provide sufficient stimulation to prevent this sort of madness. Bruce Sterling wrote a great short story about exactly that called Taklamakan, it's also about how polital powers abuse the idea of utopia to impose social control. Your screenplay's too late. Check out the upcoming xbox 360 game called Bioshock, http://www.bioshock-online.com/index.html, by Irrational Games / Take 2.